Matt Mitrovich has read 11 of 40 books. Matt Mitrovich read 52 books of his goal of 50! 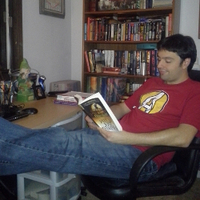 Matt Mitrovich is the founder and editor of Alternate History Weekly Update and a blogger on Amazing Stories. His new short story "Road Trip" can be found in Forbidden Future: A Time Travel Anthology. When not writing he works as an attorney, enjoys life with his beautiful wife Alana and prepares for the inevitable zombie apocalypse. Any map can teach us something about our favorite genre and this balkanized Australia map has a couple things to say. We’d love your help. Let us know what’s wrong with this preview of We the States by Adam Sivitz. We’d love your help. Let us know what’s wrong with this preview of The Fourth Reich by Gavriel D. Rosenfeld. We’d love your help. Let us know what’s wrong with this preview of A Prophet Without Honor by Joseph Wurtenbaugh. We’d love your help. Let us know what’s wrong with this preview of The Battle Over Britain by Simon Brading. GameLit is - A story with gaming elements essential to the plot. Often includes features of Science Fiction, Fantasy, or Science Fantasy.